Thought We Were Writing the Blues but They Called It Rock and Roll chronicles the career of Rose Marie McCoy (1922-2015), about whom one could be excused for asking, “Rose Marie who?” Though she considered herself primarily a singer and secondarily a composer, her legacy rests with the hundreds of songs—over 800–she wrote, though none became a substantial hit. This reality resulted not from her lack of talent but from the fact that she mainly wrote blues that were performed in the rhythm-and-blues mode by blacks for black audiences at a time when mainstream culture, including music, was dominated by whites because of social realities. Yet with her intended audience, McCoy succeeded. A veritable who’s who of rhythm-and-blues performers recorded her tunes (though adept at writing both music and lyrics, she collaborated on most of her creations), including Faye Adams (“It Hurts Me to My Heart,” which reached number one on the rhythm-and-blues charts), Big Maybelle (“Gabbin’ Blues,” featuring McCoy’s speaking), Nappy Brown (“Don’t Be Angry”), Ruth Brown (“Mambo Baby”), the Du Droppers (“Talk That Talk”), the Five Keys (“Don’t You Know I Love You”), Little Willie John (“Letter from My Darling”), Louis Jordan (“If I Had Any Sense”), Joe Medlin (“No One but You”), Little Jimmy Scott (“I’ll Be All Right”), Shirley and Lee (“Keep On”), the Thrillers (“Lizabeth”), and Big Joe Turner (“Well All Right”). All these songs were recorded in the mid 1950s, her most creative period. Subsequently, her compositions were recorded by such singers as Maxine Brown (“See and Don’t See”), Jerry Butler (“Got to See If I Can’t Get Mommy [to Come Back Home]”), Nat Cole (“My Personal Possession”), Al Hibbler (“Stranger”), Liz McCall (“Double Determination”), Ike and Tina Turner (“It’s Gonna Work out Fine”), Sarah Vaughan (“I Need You More Than Ever Now”), Lenny Welch (“Hundred Pounds of Pain”), and Jean Wells (“Ease Away a Little at a Time”). Her most recent compositions to be recorded were written with Billy Joe Conor for his debut CD (2013). “Trying to Get to You” deserves special comment because of its historic importance. Composed with Charlie Singleton (to whom Corsano’s book is dedicated) and recorded initially in 1954 by the Eagles (not the current group of this name), Elvis Presley covered it the next year on his first album, Elvis Presley. Because this release includes songs written by blacks (such as “I Got a Woman” [by Ray Charles and Renald Richard], “Money Honey” [by Jesse Stone], and “Tutti Frutti” [by Little Richard and Dorothy LaBostrie]) and because many people thought Presley sounded black, this popular album was instrumental in bringing black music, such as that written by McCoy, to white listeners, and especially to teenagers, many of whom responded to it as an antidote to and liberation from the largely insipid music to which they were exposed on white radio stations and, increasingly, television, such as that performed on Your Hit Parade. Presley also recorded McCoy’s “I Beg of You” (1957), written with Kelly Owens. In her native Arkansas, Marie Hinton absorbed the blues, committed herself to music upon hearing the International Sweethearts of Rhythm while in high school, and added Rose to her name at eighteen. After working for a family in the Catskill Mountains during the summer of 1942, she moved to New York City, where she held menial jobs (housecleaning, ironing shirts at a Chinese laundry) and began singing in small clubs. The next year she married James McCoy. Her first composition to be recorded was “After All,” by the Dixieaires in the mid 1940s. She recorded for the initial time in 1952 (“Cheating Blues” and “Georgia Boy Blues,” both of which she wrote). Soon thereafter, she and Charlie Singleton formed a songwriting team, the success of which led to her becoming wealthy enough to buy a house (in Teaneck, NJ), a Cadillac, and a yacht; her husband bought a nightclub. Soon, though, she became financially overextended to the degree that she almost lost her home. Because around this time the demand for songwriters began to decline (following the lead of such singer-writers as Chuck Berry, Fats Domino, and Little Richard, an increasing number of vocalists started performing their own material), she made money writing jingles, producing recording sessions, and managing the singer Craig Hansford. The last significant performer to record a new McCoy composition was Shirley Caesar in 1977 (“How Many Will Be Remembered”). McCoy’s later creations constitute a career denouement. McCoy was fortunate to have had Corsano as a friend. When they met at a party in 2001, they discovered that they lived within ten minutes of each other; soon, Corsano drove McCoy places, became captivated by stories the composer told, and in time decided to document the career of this accomplished woman who was not widely known. Corsano’s ultimate goal was political: to encourage the Songwriters Hall of Fame to induct McCoy into its organization. In her book, Corsano is primarily interested in McCoy’s songs and recordings of them, though she is not particularly concerned about what makes the compositions appealing. She emphasizes her focus on compositions by titling each chapter (chapters are unnumbered) with the name of one of McCoy’s tunes. For example, “I’ll Be All Right” (recorded in 1956 by Little Jimmy Scott, one of McCoy’s favorite singers) is the title of the chapter about the breakup of the McCoy-Singleton partnership. Yet this chapter is less about the song or even McCoy or Singleton than about collateral issues. Here is its structure: Corsano explains why McCoy wrote the piece, identifies singers who recorded it (Scott and Joe Medlin), specifies other McCoy-Singleton songs that Scott sang, names numerous jazz musicians who recorded for the label that recorded him (Savoy), notes that McCoy and Scott performed at the same New Jersey club, indicates that others also admired him, says that he recorded for Ray Charles’s Tangerine label, notes that he was the subject of a film documentary, and concludes by saying that McCoy had collaborators after Singleton. That is, the chapter is mostly about Scott and incidentals. The only insight the author offers about the song is that McCoy wrote it to express a feeling that attends the end of a romantic relationship, even though her association with Singleton was professional and platonic. Other chapters similarly keep McCoy in the background. Yet in her narrative Corsano often permits McCoy’s voice to dominate. For example, “Hey Look World,” “If I Had Any Sense (I’d Go Back Home),” and “My Personal Possession” are among the chapters containing more of the composer’s words than the author’s. When, where, and to whom did McCoy speak, and how were her words recorded? The author does not say. Though quoting one’s subject can be valuable, doing so excessively is often irritating, as is the case in this book. The author would have been well advised to assimilate the information the composer provided and incorporate it, when appropriate, into her story in her own words, acknowledging McCoy when necessary and quoting her only to emphasize a point or add flavor to the text. Though I am in no position to challenge McCoy’s assertions, the author seems to accept them all without question, even when some invite skepticism. McCoy tells of fighting a female pianist, a nightclub patron, and the composer Dorian Burton. Is she credible? Does Corsano believe that McCoy held the hand of nervous Savannah Churchill when the latter recorded McCoy’s “Last Night I Cried over You”? That McCoy did not know the words to “Mambo Baby” when singing it with Lionel Hampton? That someone stole bolts from McCoy’s yacht? That an executive of Commonwealth United, an entertainment company, was so moved by McCoy’s rendering of a song that he cried? That James Brown made his brass players practice so much that their lips bled? Perhaps all these claims are accurate. Without confirmation, how is one to know? Corsano deals primarily with McCoy’s professional life, which, given her goal, is appropriate. Yet she avoids asking questions that arise from personal information she provides about McCoy. This is especially the case with issues relating to the composer’s marriage, which endured from the couple’s 1943 nuptials until James McCoy’s death in 2000. Because the author establishes Rose Marie’s dedication to James (desiring to be with him, Rose Marie declined an offer to tour with Big Maybelle), one wishes to know how she responded to his leaving her several times in order to live with other women. In mentioning but not identifying Rose Marie’s “personal heartache” (153), does the author allude to James’s waywardness? She does not say. Further, Corsano states that “it’s not likely [Rose Marie] spent all those years [when James deserted her] alone” (171). Did she have lovers? Corsano does not say. During one of Rose Marie’s brief periods on the road while the couple lived together, James bought Mitzi’s Cocktail Lounge in Passaic, NJ. This impetuous purchase led to serious financial difficulties that caused Rose Marie to cover expenses by borrowing money, yet she stood by him, as she always did, including when, late in life, he developed Alzheimer’s disease. She tended to him until his death. Explaining her dedication to this philandering, financially naive man by saying only that “no one could replace James” (171) is inadequate. Might Rose Marie have had reasons for devoting herself to him? The author does not say. The shortcomings mentioned here lessen the value of Corsano’s book. Yet the author correctly identified McCoy as a worthy subject and surely wrote the composer’s story to the best of her ability. 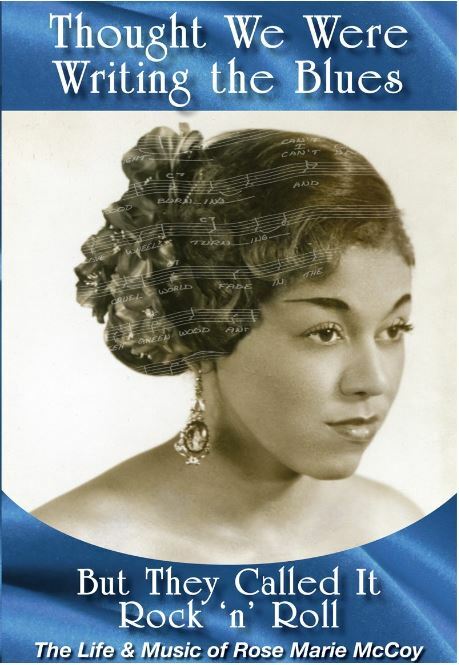 She succeeded to the degree that the book will appeal to readers interested in female songwriters or rhythm and blues. Especially because she published it herself, her dedication to McCoy—in time, in money–merits praise. Whether the book will lead to McCoy’s being enshrined in the Songwriters Hall of Fame remains to be seen.